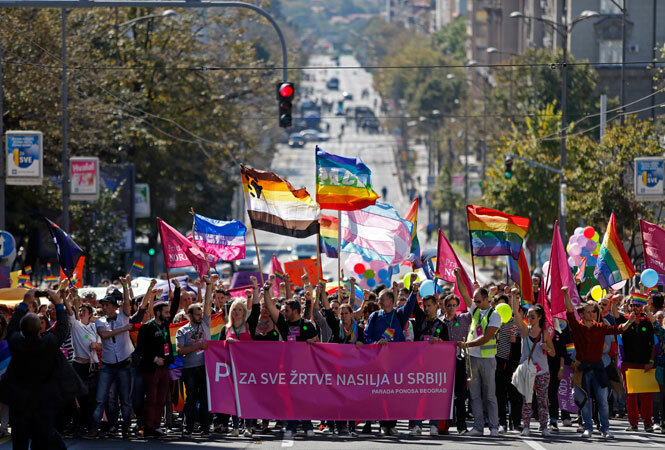 Members of Serbia’s LGBT community wave flags during the Pride March in Belgrade, Serbia, Sunday, Sept. 28, 2014. BELGRADE, Serbia — Waving rainbow-colored flags, several hundred gay activists proceeded undisturbed through downtown Belgrade on Sunday thanks to the protection of thousands of riot police. The march advanced for only several hundred meters through the empty Belgrade streets where shops were closed and public transport was stopped. Still, it was important symbolically as a rare public event staged by gays in this highly conservative Balkan country. Skirmishes were reported between small groups of extremists and police during and after the march, with soccer hooligans attacking liberal B-92 radio and TV station with flares and smoke bombs. Two policemen were injured, the station said. Also, the hooligans set one public bus on fire with flares, police said. Water cannons, armored vehicles and riot police blocked traffic on the route of the march amid threats of attacks from extreme nationalists, as Serbia tried to show it respects human rights of all of its citizens as it seeks European Union membership. Officials allowed Sunday’s event despite fears of a repeat of the violence in 2010 when right-wing groups attacked a pride march in Belgrade, triggering clashes with police that left more than 100 people injured. Authorities banned gay rights marches planned for the following three years, citing security reasons. Later Sunday, thousands of far-right supporters marched through downtown Belgrade in what their leaders said was “spiritual cleansing” of the capital after the pride event.